Q82. What is the one thing that you can do to help improve your community? Argument: If there is one thing I can do to improve my community, it would be to build a hospital. Support 2: A hospital is one of those things that Can pull every other thing to my community. Support 3: Having a hospital would also help our community members to have easy access to healthcare. 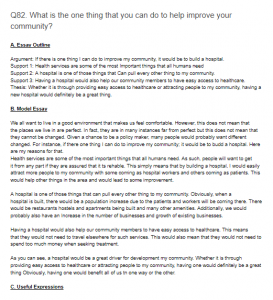 Thesis: Whether it is through providing easy access to healthcare or attracting people to my community, having a new hospital would definitely be a great thing. We all want to live in a good environment that makes us feel comfortable. However, this does not mean that the places we live in are perfect. In fact, they are in many instances far from perfect but this does not mean that they cannot be changed. Given a chance to be a policy maker, many people would probably want different changed. For instance, if there one thing I can do to improve my community; it would be to budd a hospital. Here are my reasons for that. Health services are some of the most important things that all humans need. As such, people will want to get it from any part if they are assured that it ts rehable. This simply means that by building a hospital, I would easily attract more people to my community with some coming as hospital workers and others coming as patients. This would help other things in the area and would lead to some improvement. ther amenities. Additionally, we would probably also have an Increase in the number of businesses and growth of existing businesses. Having a hospital would also help our community members to have easy access to healthcare. This means that they would not need to travel elsewhere for such services. This would also mean that they would not need to spend too much money when seeking treatment. As you can see, a hospital would be a great driver for development my community. Whether it is through providing easy access to healthcare or attracting people to my community, having one would definitely be a great thing Obviously, having one would benefit all of us tn one way or the other.